The Polymerida, which make up 95% of all trilobites, are the trilobites that most people are familiar with. 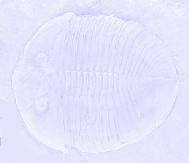 Unlike the agnostids, polymerid trilobites typically have more than two or three thoracic segments, and the pygidium is usually smaller than the cephalon. Unlike the blind agnostids, most polymerid trilobites had remarkably well-developed compound eyes. (A few, like Ductina, were blind, but this was a secondary evolutionary development.) Polymerid trilobites appear in the Early Cambrian Period, and the last ones went extinct at the end of the Permian. There is currently no consensus as to how the major groups of polymerid trilobites are related to each other. In fact, it is possible that the group is paraphyletic; the last common ancestor of all polymerid trilobites may also have been ancestral to the agnostids as well. The text below presents the polymerid trilobites as they are traditionally classified, with no evolutionary relationships indicated. For the moment, click on any of these in-line pictures for a full picture, to get an idea of trilobite diversity. We hope to fill in the gaps in this page with more images and more information as time goes on. For more pictures of trilobites, including some of the most outrageous ever seen, visit Kevin's TRILOBITE home page, maintained by Kevin Brett at the University of Alberta. This excellent page also maintains links to many other trilobite pictures and information.